J/News Articles: Women Lovin' Sailin' J/24s! A Love Story! 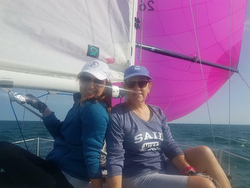 “The all-female J/24 Sailing Team, Lady MINX, recently spent a wind-whipped weekend racing on Lake Ontario in the J/24 District 7 Pendant Series Lambert Lai Memorial Regatta at the Rochester Yacht Club with many other J/24 competitors. This regatta was organized by fleet captain Dave Stoller as a tribute to an amazing man, Lambert “Lambo” Lai and significant to many of us because Lambert called Rochester home. For those of you not fortunate enough to have known him, he was an avid J/24 sailor and past president of the J/24 Class association. Lambo loved racing his prized J/24, USA 5020 - Dr. Feelgood, and took pride in advancing the sport. Case in point: When Lambo heard I wanted to buy a J/24 and start racing it with an all-female crew, he took me under his wing. He walked me through his boat pointing out all that I needed to know so that I was knowledgeable to find the right boat for me, and he helped me weed through the many boats I traveled to inspect over the summer of 2014. His insights and words of wisdom were invaluable. Sadly, Lambo passed away soon after I purchased my boat. Lady MINX was never able to race against him, but his influence, kindness, and willingness to support us lives on in our commitment to the sport and to this memorial regatta. We sail in remembrance of this talented, respected, and likeable man and he would be proud of the Lady MINX sailing team! While we are far from top-fleet competitors, we are beginning to turn heads and hear encouraging comments from our opponents as we make inroads sailing against the likes of Travis Odenbach, Kris Werner, Jack DePeters, Dave Stoller (new owner of Lambo’s USA 5020 Dr. Feelgood), Ed Gardner and other local experts who have been racing J/24’s for many years. Lambo was with us in spirit this weekend! We experienced a great regatta filled with sailing coups and conquered challenges. On day one, Lake Ontario threw everything she had at us from gusty gusts to shifty shifts to deadpan lulls challenging both competitors and the race committee alike. Winds were anywhere from 5 to 20+ knots depending on one’s location and timing. To say it was challenging, is an understatement. Weighing in at a mere 600-ish pounds of rail meat, we were easily over powered in the gusts; so we started the day with a blade but quickly realized we needed the power of a full genoa to compete in this fleet, as the competition was tough! Race committee kept a tight starting line making it difficult for many to get off in clean air, but we managed a majority of stellar starts that kept us in the game from the get-go. Our challenge for the 5 races that day was keeping the boat flat, tacking smoothly, and staying in phase with the shifts – all proving difficult. But we had a secret weapon that helped us reclaim lost footage – our new Quantum hot pink spinnaker that made it a breeze to shoot downwind. Our skill at spinnaker handling, combined with our lower weight, finally gave us a respectable advantage and we were able to overtake other contenders! Lake Ontario calmed down a bit for day two with the winds settling into 12-15 knots and staying somewhat consistent and pleasing to all who came out to play. It was definitely easier to keep the boat flat, to stay in-phase with the shifts, and to tack smoothly. Alas, we found ourselves nipping at the heels of more opponents and competing for the finish with a solid pack of competitors. We finished 3 races that day and proudly moved up a notch on the final race results. Sailing with an all-female team has its advantages! We always have great snacks and drinks and we can easily share gear! The down side is that there are a limited number of female competitive sailors, so that makes finding crew daunting. Those of us who do sail are often already dedicated to a boat. Lady MINX is supportive of and would like to see, more all-female J/24 sailboats on the racecourse. If any females are interested in getting started and would like to learn from our experiences, then please contact us and we would be happy to share our insights and struggles with you.